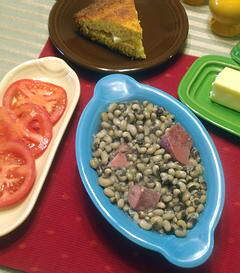 You have only days left to get your black-eyed peas ready for New Year's Day. Tradition holds that this humble little legume will bring good luck for the entire year, "if" they are eaten on the first day of the new year. Choices abound for ways in which you can enjoy this staple of Texas tables. Grandma's Cookbook contains two appropriate appetizers, Black-eyed Pea Dip and Texas Caviar (recipe links follow). Both of these spicy favorites can be enjoyed by your New Year's Eve party guests or friends visiting on New Year's Day. Folks wishing to sit down to a more traditional black-eyed pea feast can dish up Plain and Simple Black-eyed Peas or, for more adventurous tastes, Spicy Black-eyed Peas. Hot cornbread, butter and fresh green onions will complete either of these dishes like nothing else. This time of year, you're likely to rely upon canned or dried peas; it doesn't matter that they're not fresh off the vine. Just get them ready so you won't miss out. And if you're not the superstitious type, eat them anyway. They are healthful and delicious.